The report “Non-Meat Ingredients Market by Ingredient (Binders, Extenders, Fillers, Coloring & Flavoring Agents, Salts & Preservatives), Type (Beef, Pork, Mutton, Poultry), Product (Fresh Processed, Raw & Pre-Cooked, Sausages, Cured, Dried) & Region - Forecast to 2020”, defines and segments the meat ingredients market on the basis of ingredient, meat, product type, and region, with analyses and projections of the market size of each of these segments, (USD Million) and (KT). It also identifies the driving and restraining factors for the meat ingredients market with analyses of the trends, and opportunities. Multi-functional meat processing ingredients or meat ingredients alter the characteristics and properties of the meat to provide unique characteristics or contribute in their own way to the expected properties of processed meat products. Product properties that result from incorporating these meat ingredients are likely to be altered if these ingredients are reduced or eliminated, thereby making them a crucial part of most processed meats. Most meat ingredients have more than one role in processed meat; minute changes in their quantities can alter the properties of the products, making them an essential part of most processed meats. The global demand for meat ingredients is on the rise, particularly in the processed meat industry. The demand is governed by the performance quality, their incorporation in food processing, and regulations imposed by international and local governments. The rise in the food processing and meat industries, especially in developing regions such as Asia-Pacific, Middle East, and Africa is estimated to drive the market for meat ingredients. This has resulted in increasing focus of key meat ingredients manufacturers on providing superior quality and multi-functional non-meat ingredients by incorporation of advanced technologies. This will influence the meat ingredients market size in terms of volume as well as value. Key market players adopted new product launches, acquisitions, expansions, and agreements, collaborations & joint ventures as their preferred strategies to sustain in the market. 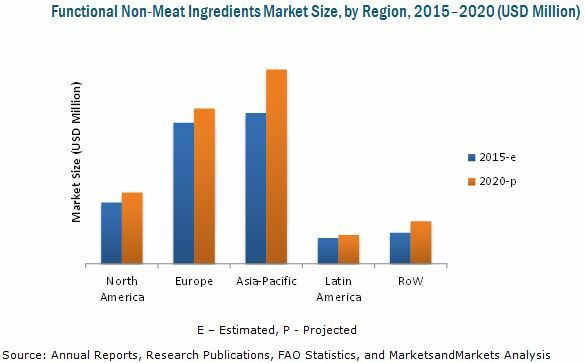 The market for meat ingredients is projected to reach USD 35,276.0 Million by 2020, at a CAGR of 3.7% from 2015. Asia-Pacific is estimated to be the largest market for meat ingredients in 2015. This region is projected to be the fastest-growing market, at a CAGR of 5.2% during the review period. This growth is mainly driven by the increasing food processing & storage and healthcare industries, particularly in developing countries such as India, Bangladesh, Japan, China, and the other Asian countries. This report includes a study of marketing and development strategies, along with the product portfolio of leading companies. It includes the profiles of leading companies such as Kerry Group plc (Ireland), Ohly GmbH (Germany), E. I. du Pont de Nemours and Company (U.S.), and Prolient Meat Ingredients (U.S.). Other key companies that are active in the market include Wenda Ingredients (China), Aliseia Srl (Italy), Campus Srl (Italy), Redbrook Ingredient Services (Ireland), WIBERG GmbH (Germany), and Advanced Food Systems Inc. (U.S.).